Van Dyke is charged with first-degree murder after shooting teenager Laquan McDonald 16 times during a police call in October 2014. He also faces 16 counts of aggravated battery and one count of official misconduct. His attorneys have argued he acted in self-defense and the shooting was justified. During their training, police officers are trained to continue firing until a threat has subsided and to reload as soon as their weapon goes into “slide lock” when it is out of ammunition. Prosecutors have attempted to use the number of shots fired and the fact that Van Dyke reloaded his gun as evidence of his intent to kill McDonald. Pappas also testified that within a certain distance – typically taught to be 21 feet – a knife can be deadlier than a gun because it can pierce soft armor. “A bulletproof vest is designed to stop bullets, not knives,” Pappas said. McDonald was carrying a knife the night he was killed and got within 15 feet of Van Dyke before the shooting began. Focusing on Pappas’ training lessons, special prosecutor Dan Weiler during cross-examination also brought up how officers are taught that they shouldn’t close the distance between themselves and a threat unnecessarily, and should try to buy time to wait for support when possible. Dashcam video of the shooting appeared to show Van Dyke taking a step toward McDonald when the shooting began. Another CPD squad car carrying a Taser was also en route and arrived at the scene less than 1 minute after McDonald was shot. 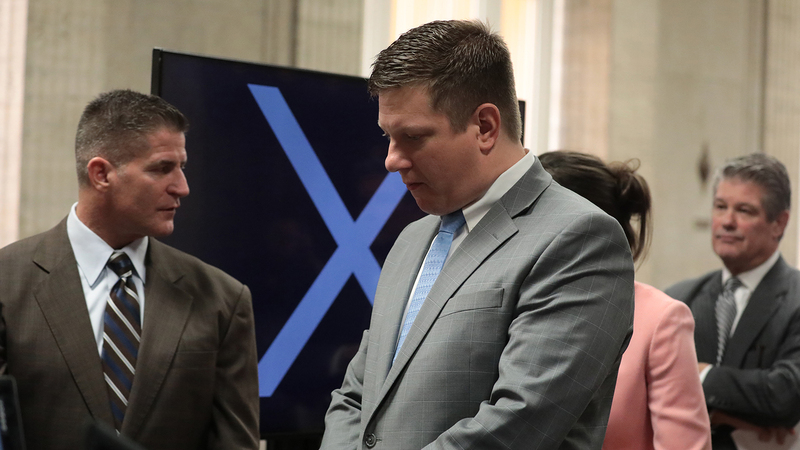 Weiler read off portions of a department general order, which states use of deadly force should only be a “last resort measure.” He also focused on Van Dyke’s decision to keep firing once McDonald fell to the pavement. “The defendant wasn’t taught to just empty his magazine once he makes the decision to shoot, right?” Weiler asked Pappas. “He was taught to shoot rapidly. He was taught to neutralize the threat,” Pappas replied. “And when you say ‘neutralize the threat,’ you don’t mean neutralize the life, do you?” Weiler asked. A defense expert believes McDonald demonstrated clinical evidence of “rage” while under the influence of PCP the night he was killed. Dr. James Thomas O’Donnell, a pharmacologist and pharmacist, testified about the effects PCP can have on a person – including euphoria, aggression, “superhuman strength” and an inability to communicate. Witnesses who saw McDonald in the moments leading up to the shooting said he never spoke. Truck driver Rudy Barillas said Wednesday it seemed the teen was tongue-tied and described the noises McDonald made as “serpent”-like. O’Donnell reviewed McDonald’s autopsy, the dashcam video of the shooting and multiple medical reports in concluding McDonald had likely used PCP shortly before his death. His autopsy revealed a level of 56 nanograms per milliliter of PCP in his system after his death – a level O’Donnell said wouldn’t be toxic, but could cause "psychiatric toxicities." Those symptoms were likely exacerbated, O’Donnell testified, by the fact that McDonald had not been taking his prescribed antipsychotic medicine. Prosecutors pushed back, saying Van Dyke could not have known that McDonald was under the influence of anything at the time of the shooting. Special prosecutor Joe Cullen also argued that if McDonald was experiencing “superhuman powers” from PCP use, then why wasn’t he able to overpower and stab Barillas before the shooting? Barillas testified Wednesday he defended himself during the attack by throwing his phone and some gravel at the teen. “And with his superhuman strength, did he overcome Mr. Barillas’s will and stab him?” Cullen asked. “No he didn’t,” O’Donnell said. Defense attorneys have said McDonald was “out of control” in the hours leading up to his death. But a woman who called police on the teen that same day said he did not appear to be a threat. Yvette Patterson said McDonald approached her and asked to use her car early on Oct. 20, 2014. She told him no and eventually called 911. But she testified that she wasn’t afraid of McDonald, and said she only called police so she could be escorted from her car into her home without issue. “He seemed like a nice young guy or whatever,” Patterson said. Patterson said she knew some of McDonald’s family and recognized that he was the person killed by police the night of Oct. 20, 2014 after hearing about it on the news the following day. Records pertaining to McDonald’s troubled past with drugs and the juvenile justice system can be presented at trial, Cook County Judge Vincent Gaughan ruled. Attorneys for Treatment Alternatives for Safe Communities (TASC) – a nonprofit offering recovery services for people with substance abuse and mental health disorders – fought to quash a defense subpoena seeking those records. They argued the records are protected under various privacy laws. But defense attorney Randy Rueckert said those no longer apply because McDonald is deceased. Citing the public interest in the records – and noting that McDonald could not possibly be hurt by their release – Gaughan denied TASC’s request and ordered them to obey the subpoena. Special prosecutor Joseph McMahon objected, claiming the records are not material and relevant to the case, before Gaughan pulled attorneys into his chambers to settle the matter outside of public view. The case is scheduled to resume Monday. Get complete coverage of the trial here.